This decadent grilled cheese just has a few ingredients, but the flavor combo will rock your grilled cheese world! 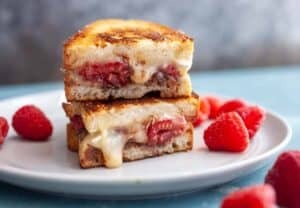 Raspberries, nutella, and brie! YES! Trim any large pieces of rind off the brie. Some rind is just fine. Place a large skillet (cast iron works well) over medium-low heat. Butter one side of all of your bread slices. A very thin layer of butter does the trick. Place bread, butter-side down, in the skillet. Spread one side of each sandwich with nutella spread. Place brie and raspberries on the second side. Flip nutella side over to make the grilled cheese. Cook grilled cheese gently over medium-low heat until the bread is well-toasted on both sides and the brie cheese is gooey and melted, maybe 3-4 minutes per side. Slice sandwich immediately and serve while warm. This delicious recipe was brought to you by Macheesmo. Read the full post at https://wp.me/pkSYO-gHN.